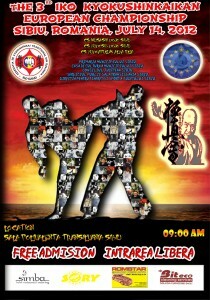 represented by Horatiu Adrian NEAGOIE Sensei, from July 11th through 15th, 2012, in Sibiu City, the 2007 European Cultural Capital. IKOK Sosai Romania General Secretary. In Sosai’s Budo, Spirit and Light, Osu!